Identification: Moyle (1976); Becker (1983); Page and Burr (1991); Jenkins and Burkhead (1994). Two subspecies: L. macrochirus mystacalis in Peninsular Florida, and L. m. macrochirus throughout the rest of the range (C. Gilbert, personal communication). Native Range: St. Lawrence-Great Lakes and Mississippi River basins from Quebec and New York to Minnesota and south to the Gulf; Atlantic and Gulf Slope drainages from the Cape Fear River, Virginia, to the Rio Grande, Texas and New Mexico. Also in northern Mexico (Page and Burr 1991). Table 1. States with nonindigenous occurrences, the earliest and latest observations in each state, and the tally and names of HUCs with observations†. Names and dates are hyperlinked to their relevant specimen records. The list of references for all nonindigenous occurrences of Lepomis macrochirus are found here. Impact of Introduction: In California, aggressive Bluegill outcompete native Sacramento perch Archoplites interruptus (Moyle et al. 1974; Moyle 1976). 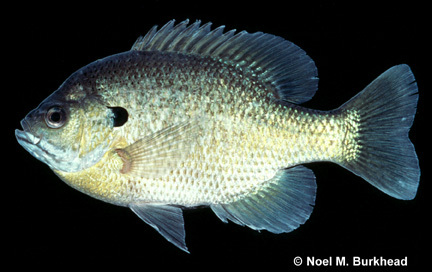 Bluegill may chase Sacramento perch away from spawning areas and out of favored places, such as shallow weedy areas, and into open water (Moyle 1976). Once in open water, the perch are more vulnerable to predation and have less available food. Introduced predatory centrarchids are likely responsible for the decline of native ranid frogs in California, California tiger salamander Ambystoma californiense populations (Hayes and Jennings 1986; Dill and Cordone 1997), and the Chiricahua leopard frog Rana chiricahuensis in southeastern Arizona (Rosen et al. 1995). Hybridizes with green sunfish, redear sunfish, redbreast sunfish, and warmouth (Scribner et al. 2001). Remarks: Bluegill are commonly stocked as forage for largemouth bass in farm ponds. Because introduced California Bluegill are typically small, possibly due to a limited genetic background, the California Department of Fish and Game began introducing Bluegill from Florida in an effort to obtain a larger, faster-growing fish (Moyle 1976). Tyus et al. (1982) gave a distribution map of the this species in the upper Colorado basin. Anonymous 2001. Oregon's Warm Water Fishing with Public Access. [online]. URL at http://www.dfw.state.or.us/warm_water_fishing/index.asphttp://www.dfw.state.or.us/warm_water_fishing/index.asp. Bradley, W. G. and J. E. Deacon. 1967. The biotic communities of southern Nevada. Nevada State Museum Anthropological Papers No. 13, Part 4. 201--273. Moyle, P.B., S.B. Matthews, and N. Bonderson. 1974. Feeding habits of the Sacramento perch, Archoplites interruptus. Transactions of the American Fisheries Society 103(2):399-402.